Prime Grizzly viewing in our sub alpine camps is June 1st through July 15. But most horse pack trips see grizzlies right through to October. Last week our Guide School saw a Sow with 4 cubs, a pretty unusual sight! Ride with your horseback guide into the beautiful Chilcotin mountains and watch these awesome animals from your horse. 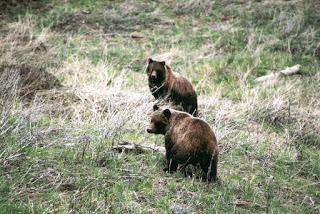 We also do truck-based Grizzly viewing day trips, and have courses in bear defense for those who want to enjoy the wilderness in a responsible way when on their own. Call us for details and to book your opportunity to see these animals in their home. A true Canadian experience unlike any other. Going with a horseback guide enables you to be part of the astounding nature of British Columbia.